The kingdom of Saba is known to have existed in the region of Yemen. By 1000 BC caravan trains of camels journeyed from what is now Oman in south-east Arabia to the Mediterranean. As the camel drivers passed through the deserts of Yemen, experts believe that many of them would have called in at Marib. Dating from at least 1050 BC, and now barren and dry, Marib was then a lush oasis teeming with palm trees and exotic plants. Ideally placed, it was situated on the trade routes and with a unique dam of vast proportions. It was also one of only two main sources of frankincense (the other being East Africa), so Saba had a virtual monopoly. Marib's wealth accumulated to such an extent that the city became a byword for riches beyond belief throughout the Arab world. Its people, the Sabeans - a group whose name bears the same etymological root as Saba - lived in South Arabia between the tenth and sixth centuries BC. Their main temple - Mahram Bilqis, or temple of the moon god (situated about three miles from the capital city of Marib) - was so famous that it remained sacred even after the collapse of the Sabean civilisation in the sixth century BC - caused by the rerouting of the spice trail. By the that point the dam, now in a poor state of repair, was finally breached. The irrigation system was lost, the people abandoned the site within a year or so, and the temple fell into disrepair and was eventually covered by sand. Saba was known by the Hebrews as Sheba, and it survives today (Saba = Sa'abia = Saudi Arabia). Father of Balkis. Former chief minister. Legends, folk memories and religious accounts contain various versions of Saba's most famous ruler. 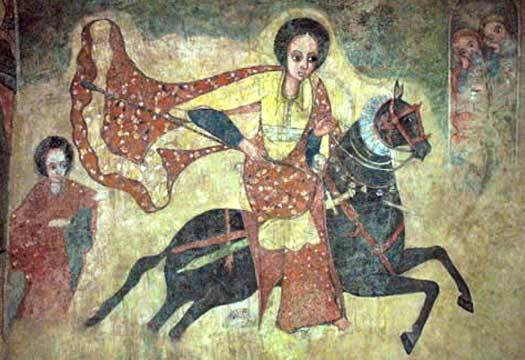 Generally, she is believed to have been born in 1020 BC in Ophir and educated in Ethiopia. Her mother is Queen Ismenie, her father is chief minister to Za Sebado, and succeeds him as king. At least five kings precede her. Usually accepted to be the legendary Queen of Sheba. According to the Old Testament, the Queen of Sheba visits Solomon of Israel, bearing riches, and is seduced by him. Nine months after her return from Israel she bears a son, Menelik. He returns to Israel and from there travels to Africa to found the Ethiopian empire. Saba is not mentioned again in ancient sources. Saba collapses as a civilisation following the rerouting of the spice trail. The inhabitation of Marib continues in reduced circumstances. Under pressure from Byzantium, the Christian kingdom of Ethiopia installs a Christian king in Yemen, so links between the two states must have been maintained. The ancient dam finally gives way and Saba's irrigation system is destroyed. Marib is deserted within a year or so and the buildings left to the desert. Yemen is finally unified by President Saleh, but the countryside is still bandit territory, and dangerous to outsiders.